If you’re getting sick of this subject, imagine how I feel. I’m only one man, with many other pressing matters to attend to. However, a while back three profo explainers at the Huffington Post came up with a series of wrongheaded remarks on the excellence of Hamilton when compared with Jackson, and it’s been galling me, so here I go again, as the great communicator used to say. N.B. I don’t like Jackson. Hell, I don’t like any of these people, and they sure as hell wouldn’t like me. They wouldn’t like you either. This isn’t a fansite — though that’s what I’m beginning to fear a lot of history really is. “Hamilton, one of America’s founding fathers, was a strong opponent of slavery, and was an early member of the New York Manumission Society, an abolitionist group. . . “ Too far a stretch, confusing manumission with abolition. You’d almost think Grim, Barron-Lopez, and Carter weren’t aware of my earlier blog posts on this matter, here and here. Keep up, people. “Andrew Jackson, meanwhile, a War of 1812 hero, was a slave owner.” I think by “meanwhile,” the authors mean something other than “occurring at the same time as something already mentioned”; they must mean “for his part” or “by contrast,” and the intent, if not the mot, is clear: disparage Jackson by contrast to Hamilton over slaveowning. They never say Hamilton wasn’t a slaveowner, but they imply it, and the record doesn’t support the implication. Which, again, I thought I’d already clarified (see links above): it really is tedious to have to keep repeating these things. Anyway, “slaveowner” applies to all kinds of people (including many members of the Manumission Society) whom the authors refrain from attacking, so what’s their point? Oh. Wait. Here it comes . . .
“Even more perniciously, Jackson carried out an ‘Indian removal’ policy as president.” Indian removal, the authors assert here, is more pernicious than slaveholding. (That’s why we have explainers; otherwise we might not know which is worse.) Really, I doubt they meant to make that assertion, because how on earth would they know which is worse, but this writing thing is hard. Such a flailing-in-the-dark opening phrase must reflect the authors’ dimly gathering sense — you can feel it start to nag at them as they write, just not hard enough, unfortunately, to get them to stop writing — that if “slaveowner” were to disqualify a founder from appearing on currency, there wouldn’t be many founders there. So they come up with what they inform us is the distinguishingly awful characteristic of Jackson: Indian removal. And now things get really silly. “. . . decades of policy in the United States and the preceding British colonies had sought coexistence and reconciliation with various native peoples. Jackson’s policies reversed these efforts. . .” This is straight-up nonsense. (Well, one thing here is true: the colonies came before the United States. Hence, I guess, “the preceding”?) Many colonial lieutenant governors’ and colonial legislatures’ policies, and those of (“the following”?) United States, from its inception, were dedicated to seizing Indian land and pushing Indians out. 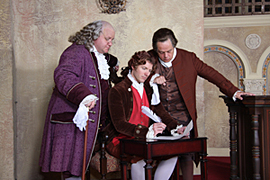 In the later colonial period, the royal government at Whitehall did try to prevent white expansion westward and to reserve land for Indians: after Jeffrey Amherst was recalled and Thomas Gage took over, Ministry policy became more beneficial to indigenous people than anything the Americans (and some of their royal governors) were cooking up, and a lot of indigenous nations knew it; that’s why they allied with England in what, for Indians, was only the latest and worst episode in a forty-year war to defend their homes from American incursion for the purpose of real-estate speculation. Ministry efforts to make what is now the Midwest a permanent Indian country served as a cause of war for American independence; American desire to conquer that region was a cause of forming our nation; in 1794 the first war the nation ever fought brought about the conquest. The U.S. did tell the Indians that all of this was in service of coexistence, but that doesn’t mean HuffPo writers in 2016 should believe it; most of the Indians involved sure didn’t. The authors might not think pushing Indians into smaller and less familiar places qualifies as “removal.” It does, but anyway, the idea of someday moving all Indians west of the Mississippi originated with and played into the American Revolution and into the very basis of nationhood. Hamilton, vaguely connected by the authors to this fanciful “coexistence and reconciliation” policy, was really at one with Washington, Jefferson, and all the others in pursuing various forms of military incursion on Indian land, with various schemes, including removal, for coping with continued Indian presence. “There is an American West is a Western Country. It will be settled,” said Hamilton (emphasis his), and nobody fought harder than he to originate the army that accomplished that goal: the United States Army, that is, which came into existence precisely for the purpose of carrying out the conquest. Jackson didn’t “reverse” anything, and what followed involved the likes of Lincoln and Grant, but again the authors seem to be getting nervous about where their assertions might end up leading them, so . . .
“Jefferson was a slave-trading landed elite whose esteem for farmers is often confused under contemporary politics with a ‘small is beautiful’ rural utopianism.” It is? Well, maybe “under contemporary politics,” whatever that means, but smacking Jefferson around like this is only what Hamiltionians have been doing for years; Jeffersonians do the same to Hamilton; it’s all crap, and I really thought I’d made that clear, here, for example, and here. Oh well.